Update yourself with Ghajini, Ghajini Movie Review, Aamir’s Eight Pack Abs in Ghajini, Ghajini Release, Starcast of Ghajini, Bollywood Ghajini Movie. Watch out for Aamir Khan’s Eight Pack Abs in his forthcoming movie “Ghajini”. 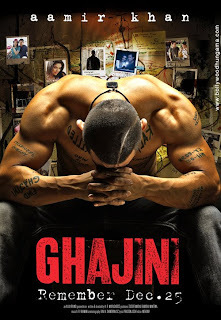 Scheduled to hit the theaters on December 26th, “Ghajini” is a remake of super hit Tamil movie “Ghajini”. This romantic thriller has been directed by A.R. Murugadoss and co-produced by Allu Arvind, Madhu Varma and Madhu Mantena. Aamir has been working really hard for his eight pack abs for “Ghajini” and it took him about an year to build those perfect eight pack abs. Mr. Perfectionist can settle for nothing less than the best, so instead of flaunting six pack abs like Shahrukh Khan, he sweated out more to be even better with not six but eight pack abs in “Ghajini”. “Ghajini” is a movie about once-rich businessman, who suffers from a short-term memory loss. This is followed by a violent encounter in the movie and to make it more real, Aamir has donned a new hairstyle with a scar on head, which has already impressed many in the town. With music composed by none other than A.R Rehman, “Ghajini” is already getting popular for its six songs, out of which “Guzarish” is already hitting the chartbusters. In the movie you will get to see South Indian actress, Asin Thottumkal starring opposite none other than Aamir Khan. For all you Aamir’s fans watching his eight-pack abs will be a true pleasure.